Please check availability calendar! It is up to date. 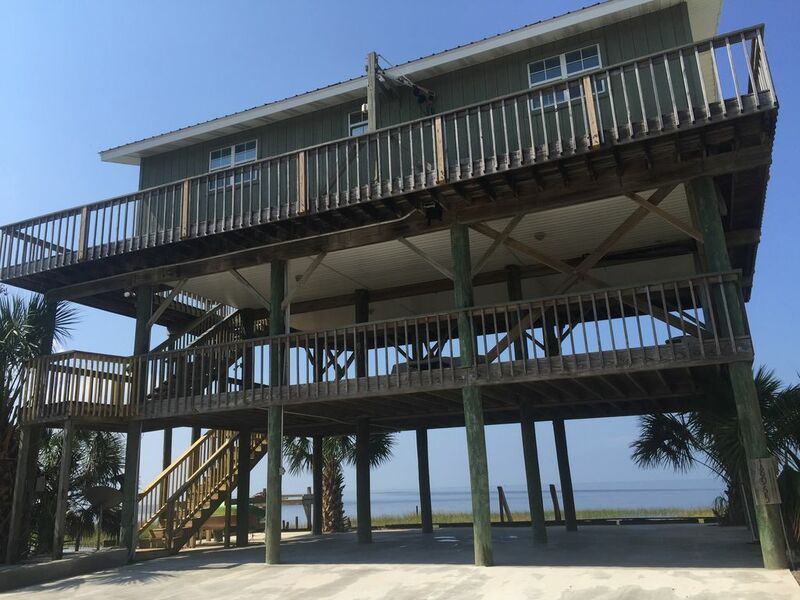 Our 2 bedroom 1 bath house sits on high stilts directly overlooking the Gulf of Mexico. Located in undiscovered Dekle Beach, Florida. It is a retreat from everything. We are about three miles up the coast from Keaton Beach. The home overhangs the Gulf, with the high tides lapping against the sea wall. The porch/deck looking out on the Gulf. Sunbathing is great right on the 3rd story wrap around deck. There is an open mezzanine floor between the house and the ground level and covered parking at ground level. Great for grilling in a rain, baby cribs and lots of people room. Relax and read on the couch on the mezzanine. You will enjoy breathtaking gulf views and fabulous sunsets. FISH CLEANING TABLE WITH RUNNING WATER!! There is now 3 full bays open for cars and boats. No street parking. Steps down into the water! After 2016, I will no longer rent the house for more than 1 month. I am sorry. I'm 70 years old and I live in Ocala, Florida. My husband and I purchased the house is 2001. I have rented the house for several years and have had fantastic reviews through other vacation websites. i also have two places on the Atlantic coast and are also available for rent through this website. I take great pride in my beautiful places and am very responsive to any of our guests' needs. I do not live locally but can be there in 2 1/2 hours. I have a team of folks that help me with any issues you may encounter. I am available by phone but especially by email. It is so peaceful! The area is still pristine and undisturbed. I love to study the stars and at night, on a clear night, the Milky Way is breathtaking. The weather is always a pleasure, whether it is a sunbathing day, or a stormy night. I also love bird watching. I like to sit with binoculars and identify them. At night, we grill out on the nice double hibachi grills and enjoy talking and being with family. Underdeveloped Florida is almost a thing of the past. Dekle is a nice community of 43 houses. Scalloping season is the high season and often the scallops are right out in front of the house. 2 kayaks are there for your use. Fishing is great as well. Directly on the Gulf of Mexico. 180 degree clear view of water. Gulf Front Home with internet and WIFI 2 Bedroom...1 king, 1 queen, one double mattress, one couch. Sleeps 6...one bath Full Kitchen...NEW oven, dishes/cookware/utensils microwave, toaster, coffeemaker, magic bullet food processor washer/dryer, linens/towels/beach towels, hair dryer, 5 chairs for the deck NEW AC/heat 32' Sony Bravia TV, cable TV, DVD,VCR, CD, phone (but you need a phone card for long distance out going calls), answering machine. At this point All Tell and Verizon cell phones work, wrap around balcony, deck, hibachi grill, covered parking for one vehicle SMOKING OUTDOORS ONLY! Pets allowed with owner permission with a small extra charge. Very clean and well maintained. Weather was nice even for February. Quiet and peaceful with great view of the gulf. Yes, sometimes February is very nice. It can be very cold as well. Please come back as soon as you can. It is a beautiful setting, plenty of room for a family to enjoy especially on the open 2nd deck! Our only regret is that we could not spend more time there! We were in the area for a family wedding so that required most of our time!! Great place to unwind and enjoy the views. We had a wonderful few days with family and friends, what a great place to just BE in the moment, everything that you might need is provided to make your stay stress free. Looking forward to going back again next year! We loved the Gulf Front Sunset House . It had everything we needed .We had some great family time there . We have already started talking about planning another trip to Dekle Beach. I am so glad you enjoyed my home. It’s more than that because families slow down and have fun together. Please come back! Wonderful place to stay and great location! Stayed for A couple nights while we were in the area scalloping. The house was clean and furnished with most everything you need. The location is perfect and is very close to Keaton Beach boat ramp for fishing and scalloping. I would recommend this rental to anyone looking in this are. Owner was also very responsive when I had questions or concerns. Hi, there, and thank you for the nice review! You are welcome anytime. For your use there are 2 one-person kayaks and paddles. There is a private locked concrete boat ramp one block away (and a key is provided). This rental is perfect for nature lovers, other lovers, families, and fishermen. Great redfishing in salt marshes is within close kayaking distance. Exceptional scalloping during summer scalloping season. It is located in one of the few remaining pristine Florida coastal areas called Nature Coast. It is one hour south of Tallahassee, FL. 30 minutes south of Perry, FL and 30 minutes north of Steinhatchee.